GoLion -- Collection 3 now available!!! Hyaku Ju Oh Goraion (King Of Beasts Golion) is an animated series that aired in Japan in 1981. It ran for only one season and comprised of 52 episodes. The series, which was not popular in Japan, was later dubbed into the successful Voltron -- Defender Of The Universe Lion Force series. When GoLion was dubbed into Voltron, certain elements were changed and some footage was excised, mostly shots that contained violence or visuals that were not suitable for children. 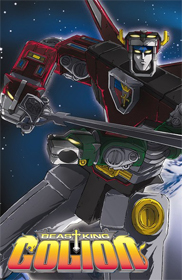 This website covers the various differences between GoLion and Voltron, and has a plethora of screenshots of cut footage and will soon have several video clips of scenes that were excised from Voltron. Because GoLion is in Japanese and I don't understand the language, some information on this site may be incorrect. All information pertaining to GoLion I got from various sources, including Voltron/GoLion fans, several fansubbed episodes, unverified information from some visitors, and info from other sites. Put up a Non-Episode Cuts section. It's half-complete at this stage. I also updated the "Episode 1 Cut Clip -- GoLion opening scene" clip in the Multimedia section. The clip now contains burnt-in English subtitles.